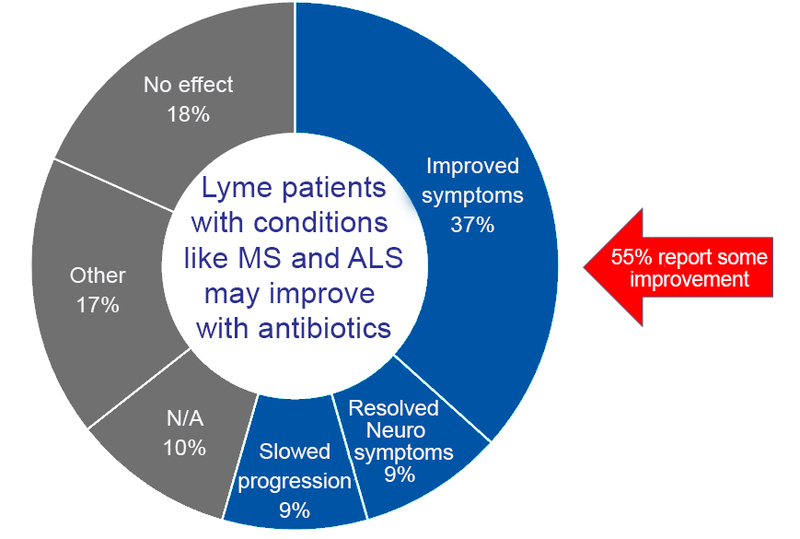 LYMEPOLICYWONK: Do Antibiotics Help Lyme Patients who have MS? Periodically, I post information about some of the findings from our big data project, MyLymeData. We call these “Quick Bytes.” In April, my Quick Byte on neurologic Lyme disease focused on how often Lyme patients are misdiagnosed with a neurologic condition. The blog included a brief survey for those whose neurologic Lyme had been misdiagnosed. The survey asked about any antibiotic treatment they may have received. I report on the results of that survey here today. Our MyLymeData registry asks patients if they were initially misdiagnosed with another illness, and if so, what the illness was. About 20% of respondents were told they had a neurological disease. 14% were misdiagnosed with MS, and 2% with other neurological diseases; like ALS, Parkinson’s and multiple system atrophy. 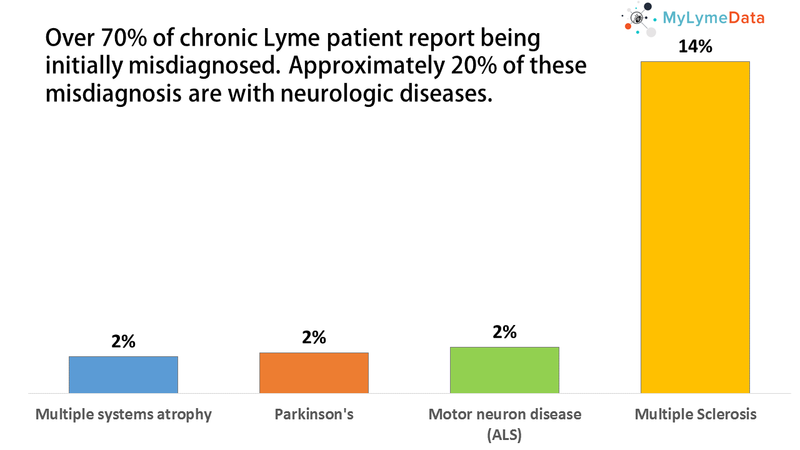 When looking at this data, it is important to recognize that geography may play a big role in both the prevalence of neurologic conditions and Lyme disease in a particular area. The survey that accompanied my previous blog asked a few questions to readers about their experience with neurologic misdiagnosis. Mainly, we wanted to know if someone previously misdiagnosed with a neurological disease had tried antibiotics and whether these had affected the course of their illness. See the questions we asked below. Over 700 people had taken the short survey at the time we analyzed the data. So, did antibiotic treatment have any effect on the people in the survey who were treated with them? 55% reported some improvement. Of these, 37% reported that their symptoms diminished. 9% reported that their neurological symptoms resolved with treatment, and 9% reported that the progression of their illness slowed. There are some important limitations of the information presented here. First, the sample size was small and it was self-selected. Patients with positive experiences with antibiotics may have been more willing to take this survey. 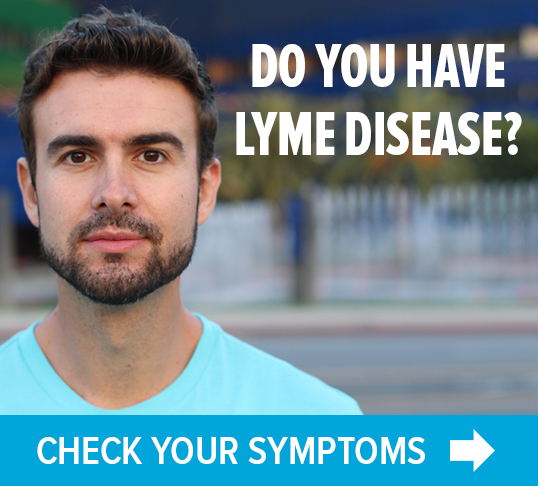 Although 700 had taken the survey, we limited our results to those who had been diagnosed by a healthcare provider with Lyme disease and who had been previously misdiagnosed as having a neurologic disease. The resulting sample was 190 patients. The second important limitation is that survey data cannot demonstrate cause and effect. For that, a more intensive research project using a randomized control trial design would be needed. Still, the survey data suggests that patients with a neurologic condition who are diagnosed with Lyme disease may improve with antibiotic therapy. This offers hope to some patients with these conditions, especially since treatment approaches for neurologic conditions are not curative. The potential of antibiotics to diminish symptoms, delay progression of illness, or in some cases (9%) to completely resolve neurologic conditions is important news for the community. We believe that this data shows the potential for MyLymeData to help improve care for patients. If you are not a part of MyLymeData, please enroll today. The LYME POLICY WONK blog is written by Lorraine Johnson, JD, MBA, who is the Chief Executive Officer of LymeDisease.org. 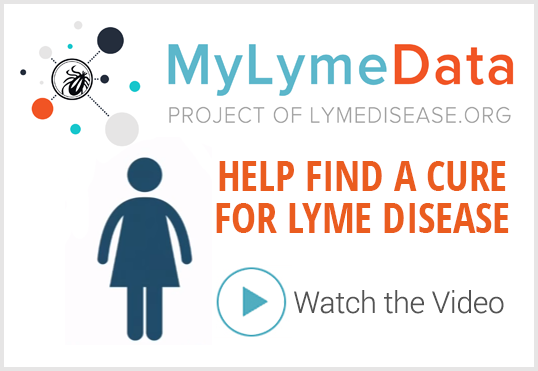 You can contact her at lbjohnson@lymedisease.org. On Twitter, follow her @lymepolicywonk. If you have not signed up for our patient-centered big data project, MyLymeData, please register now. Next Post » Do antibiotics help patients with Lyme disease who are also diagnosed with MS? The first Lyme patient I treated with Hyperbaric Oxygen presented with the diagnosis of MS. That was almost 20 years ago. Her die-off in the chamber was so severe she left my center angry and confused even tho I tried to explain she had been misdiagnosed (apparently) and that she more likely had Lyme not MS. I have treated patients with both illnesses: however, “real” MS seems to be a retrovirus infection and responds to anti-retroviral therapy as well as hyperbaric oxygen. for last 6 years I saw many different specialist and was treated for RA, lupus possible MS and the list goes on till about 8 moths ago I was told that I may have Lyme . The doctor put me on natural Lyme meds and I did respond well, till about 2 weeks ago I started to feel not well again so she said I should see a Lyme specialist . A good friend was treated with antibiotics for a year (he had to carry a cart with the bag when out of his home) and he tells me he was worse off for is. I received an IV antibiotic three days after being bitten by the infecting tick. I followed this with oral antibiotic for three weeks…..no impact at all. The symptoms have continued to progress. The only relief I experience is when I workout intensely and break a good sweat……I have read that raising the body’s temperature triggers release of additional white blood cells which help contain the spirochete pathogens. It makes sense if simply treating with antibiotics defeated this pathogen – no one would have it beyond treatment. I am a Computer Science professor, not an MD, but this is common sense. I would like to point out that it is also possible to be diagnosed with ALS or MS later on in the disease, not just initially. These symptoms can come from lyme progression as well. And the response to treatment can vary depending on what other symptoms have appeared as well. I have known some with an ALS presentation that was the beginning of the disease, and others who developed it some years later after a lot of other lyme symptoms came first and were treated. 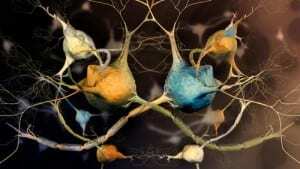 The treatment in either case frequently requires a less aggressive approach because the herxheimer can kill off more neurons and make it worse. The ALS researchers, who do not understand lyme, say that half of a person’s neurons are dead by the time the typical wasting begins. So, you would definitely not want to lose anymore. So, the point here is that the survey may not have included all the ALS type presentations in the survey group, because of the wording. And the response to treatment in ALS/Lyme may only be a holding action, and in itself is success because these people will die without treatment and might die faster with aggressive treatment. ALS/Lyme needs to be studied so that a more effective treatment can be found, along with all the other presentations. Are there other differences that need to be taken into account? It is astonishing that so many different symptoms and presentations can be produced by one pathogen. But of course, coinfection just muddies the water. Klenner et al. – myself included, would argue with the idea that neuro diseases are not curable… I am on month 45 of high dose Lipo C and each onion layer deeper that my turbocharged immune system cleans, provides suggestive symptom shift evidence of depper and deeper cleaning. When Robin Willliams left due to parkisos, I was already on my journey to elimiate viruses from my body with the high dose Vit C. Jungblut showed us that viruses travel in through the nervos system. The pathologists now that Parkinson’s corpses are riddled with viruses in the substantia negra, andKlenner taught us that enough C would wipe ay viruses. So – let’s keep going. Thanks for the great article. Lately I’minto herbs; after a year of sporatic antibiotics and helmethiques. Ivermectin, fenbenetc. today it’s wormwood, black walnut and clove tea… After the C program started, I started to notice occasional internal migrations of stuff, or bio-scoby slime towards the extremeties as my core got cleaned.. Pretty amazing the human body. My wife went through dozens of such misdiagnoses, wrong treatments, and unnecessary surgeries before she was effectively treated for Lyme and related co-infections over several years (with the treatment for Babesia finally stopping the relapses). Her first indication that it was infection was not a diagnosis of Lyme, but rather surgery for a misdiagnosed sinus infection and treatment for misdiagnosed (un)ruptured eardrum, for each of which she received amoxillin. Given her experiences with Lyme and Babesia, we tell people who’ve dealing with symptoms consistent with Lyme to ask their doctor for a month supply of doxycycline or amoxillin (doxycycline is commonly dispensed as a prophylactic for travel in some malaria regions). If they start feeling better with doxycycline in a week or two, as did my wife, then its a good bet that they are dealing with a treatable bacterial infection of some type, and they can dismiss the hurtful diagnoses of psychosomatic disease, motor problems, incurable neurologic disease, etc. what are similar symptoms between Lyme; MS; ALS as mentioned in this thread? so, what’s out a stiff neck… that eventually heals (becomes full range of motion); however, the neck grinds – as well as multiple creaking joints, throughout the body… would those be symptoms of Lyme? No rash, no flu like symptoms? My dear friend who had a diagnosis of MS for many years tested positive for Lyme disease via a standard lab. She was treated with IV antibiotics for 30 days. Afterward, she was able to stand for the first time in 5 years. Unfortunately her local physicians would not continue the IV treatment and, though her condition stabilized for a period, she is no longer making progress. All too common a story but what is stopping her from finding a physician who will continue her treatments? I was diagnosed with lupus here in USA then I went to see Dr. M Lazo in Tijuana Mexico who after doing a test on me on what they call “Dark Chamber”, told me Positive for Lyme disease. He treated me with antibiotics and almost immediately I was fine. Took antibiotics for 5 month until my doctor here in the USA told me No More! It’s been 4 months with out it . Still OK but now and then I feel signs. I am afraid to relapse. Should I have kept going with the antibiotic? Another patient of Dr. M Lazo who I met in his office and who I keep in touch kepos going with the medication and is doing fantastic. Another patient who leaves in Guadalajara didn’t do well and went back to her ehumathologist. While I can’t give you specific advice, it does not sound like you are done with this infection. So I was told here in USA, that antibiotics are not to be given for more than 15days. I took doxicicline for 5 months , my doctor in Mexico told me I have to keep going with the medication but my family doctor suggested not to. How long can you be going on antibiotics under supervision? I was takenl flagenase, fluconazol, doxicicline y el deflazacort.for about 5 months. Medication I got it in Mexico and it did me well although Dr. Lazo wanted me to continue with it. Before that I was taken Prednisone for 4 years, hidroxiclorenquine alone with some more. At last I was being injected with Retoxin plus my medication and doing nothing for me. I was depressed, always tired and unable to continue with my daily life. I needed help for everything….To go-to the bathroom, to get out, to dress up, to go to bed or turnover in it,. I couldn’t work. But now after taking those antibiotics I am feeling like a new person although something tells me I am not done with it. I like to know , if anybody knows how long can a person be on antibiotics for this condition ? I too was misdiagnosed with MS while being diagnosed with Lyme and co-infections by another doctor simultaneously. The problem is, the dr. treating me for Lyme did not accept insurance. Being disabled now and on Medicare, I find that it’s almost impossible to get antibiotics paid for, even though they seem to slow down and improve the MS symptoms;especially is you try to get intravenous antibiotics, which i have never been able to get financially. The problem now is in the healthcare system and in the politics going on involving the big Pharma companies wanting to make huge profits on MS medicines and not wanting to see people with Lyme get cured. It’s about profits now. Correct, for as I said in my book Incurable Me, there is no money in the cure. Having said that you can often get meds overseas for a heck of a lot less. And the reason Doc’s like me don’t take 3rd party payer reimbursement is they won’t reimburse for the diagnostic codes we will often use, so it is a constant fight and struggle with 3rd party payers. It is very disheartening when a patient is under the care of a LLMD and having navigated 3 different protocols, antibiotics, etc. yet no change. Bitten by a tick at age 8 and now in my 50s but did not begin having sx until approx 7-8 years ago. Could have been re infected over the years but unsure. Similar to others, 20+ physicians later, continuous misdiagnosis until last year I tested positive for Lyme. Finally an answer to the declining health only to face dismissive conduct from any physician who is not an LLMD. That said, even when the treatment via an LLMD fails, after thousands of dollars spent out of pocket, a patient is left broke, distraught and in worse physical condition than before. Being obviously late stage I understand there is no remedy for me. Lyme has terminated in my heart and the pain is unbearable at times. Each day a carditis patient exists waiting for the inevitable to happen. Even with a documented record with three different cardiologists, echocardiograms revealing MVP but nothing else to determine the significant heart pain, vigorous heart beats, forced to sleep upright, shortness of breath etc…… not one cardiologist will investigate further and they’ve disagreed with my LLMD regarding my carditis dx. The abhorrent and dismissive attitudes from these physicians does nothing more than fail the patients with worsening conditions. I agree with a previous commenter here in that later MS, lupus or ALS can develop from an early causative factor such as Lyme. It pains me that we have advocacy groups for these other diseases but if humans don’t focus on the root problem of Lyme which is becoming more evident to be the root problem with many of these conditions, then possible cures for other diseases will not occur. Apologies for length in script but very frustrated knowing our society is in this position without the support from the medical community for more funding into research. Sadly, thousands more will have to die before this occurs. I being one of them. I just want to point out I was a completely healthy person when I was given a Fluoroquinolone Antibiotic called Levaquin, similar to Cipro, Avelox or Floxin, all in the same family; I shortly became completely disabled from it with many conditions including a severe neuro condition called Peripheral Neuropathy over 50% of my body, it is just one ‘side effect’ possible from Fluoroquinolone Antibiotics which is more than likely one given to those mentioned in this article… beware PLEASE! I suffer greatly because of just 10 pills!